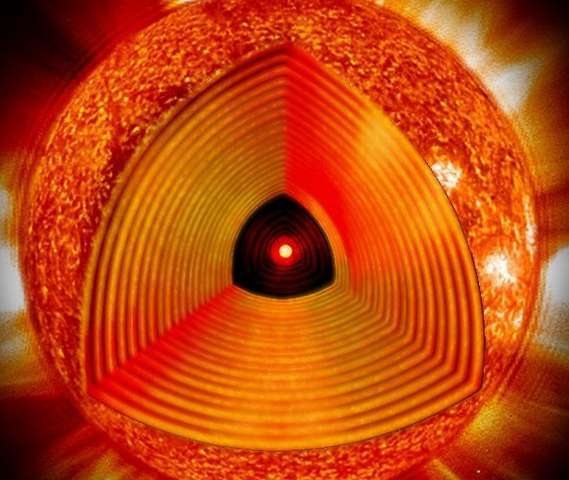 At first glance, it would seem to be impossible to look inside a star. An international team of astronomers, under the leadership of Earl Bellinger and Saskia Hekker of the Max Planck Institute for Solar System Research in Göttingen, has, for the first time, determined the deep inner structure of two stars based on their oscillations. Our sun, and most other stars, experience pulsations that spread through the star's interior as sound waves. The frequencies of these waves are imprinted on the light of the star, and can be later seen by astronomers here on Earth. Similar to how seismologists decipher the inner structure of our planet by analyzing earthquakes, astronomers determine the properties of stars from their pulsations—a field called asteroseismology. Now, for the first time, a detailed analysis of these pulsations has enabled Earl Bellinger, Saskia Hekker and their colleagues to measure the internal structure of two distant stars. The two stars they analyzed are part of the 16 Cygni system (known as 16 Cyg A and 16 Cyg B) and both are very similar to our own sun. "Due to their small distance of only 70 light years, these stars are relatively bright and thus ideally suited for our analysis," says lead author Earl Bellinger. "Previously, it was only possible to make models of the stars' interiors. Now we can measure them." To make a model of a star's interior, astrophysicists vary stellar evolution models until one of them fits to the observed frequency spectrum. However, the pulsations of the theoretical models often differ from those of the stars, most likely due to some stellar physics still being unknown. Bellinger and Hekker therefore decided to use the inverse method. Here, they derived the local properties of the stellar interior from the observed frequencies. This method depends less on theoretical assumptions, but it requires excellent measurement data quality and is mathematically challenging. Using the inverse method, the researchers looked more than 500,000 km deep into the stars—and found that the speed of sound in the central regions is greater than predicted by the models. "In the case of 16 Cyg B, these differences can be explained by correcting what we thought to be the mass and the size of the star," says Bellinger. In the case of 16 Cyg A, however, the cause of the discrepancies could not be identified. It is possible that as-yet unknown physical phenomena are not sufficiently taken into account by the current evolutionary models. "Elements that were created in the early phases of the star's evolution may have been transported from the core of the star to its outer layers," explains Bellinger. "This would change the internal stratification of the star, which then affects how it oscillates." This first structural analysis of the two stars will be followed by more. "Ten to 20 additional stars suitable for such an analysis can be found in the data from the Kepler Space Telescope," says Saskia Hekker, who leads the Stellar Ages and Galactic Evolution (SAGE) Research Group at the Max Planck Institute in Göttingen. In the future, NASA's TESS mission (Transiting Exoplanet Survey Satellite) and the PLATO (Planetary Transits and Oscillation of Stars) space telescope planned by the European Space Agency (ESA) will collect even more data for this research field. The inverse method delivers new insights that will help to improve our understanding of the physics that happens in stars. This will lead to better stellar models, which will then improve our ability to predict the future evolution of the sun and other stars in our galaxy. Finally. Now the authors of this method will determine the inner composition of Sun (Ø 1.392.000 km) and Jupiter (Equatorial radius 71,492 km). If they see the inner structure for very distant stars, this will be their cats cough (the only problem may be that the authors write nonsense).